Bank of America's donation of land for affordable housing uptown includes this parking lot behind Charlotte Ballet and the McColl Center off North Tryon Street. The second of two parcels to be donated by BofA is at Seventh and North Tryon streets. Last week, three big financial companies in Charlotte pledged $70.75 million to help the city remedy a lack of affordable housing. It includes below-market-rate loans, grants and something else the city desperately needs — land for affordable housing uptown. Thousands of new luxury apartments have been built uptown in recent years, and more are under construction. Monthly rents can run from $1,500 to $15,000. But what if you're a dishwasher, security guard or administrative assistant not making top dollar? Housing advocates say those folks should be able to live uptown, too. So buried in last week's announcement was a pledge by Bank of America to donate two parcels of prime real estate off North Tryon Street uptown for affordable housing. BofA’s Charlotte Market President Charles Bowman said it was part of the company’s effort to improve the area around its uptown headquarters. “A mixed-income group of people living together makes for a stronger community. … And we want the people who work here to also have opportunities to live here if that's what they choose to do,” he said. 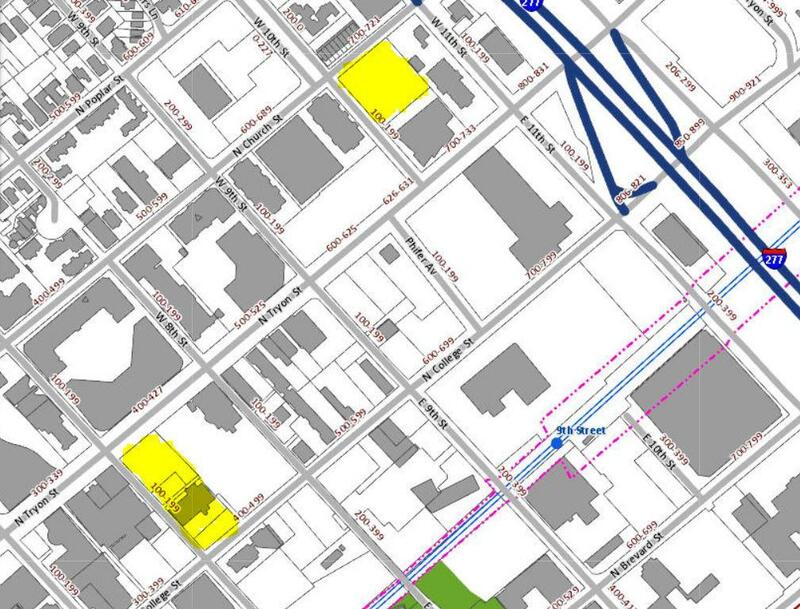 The two parcels are in the North Tryon Street corridor of uptown - one near Charlotte Ballet and the McColl Center (top) and one at 7th and Tryon. The land is worth $7.25 million. The donation would reduce future developers' costs and allow them to charge below-market rents aimed at lower-income workers. “If you're doing affordable housing, there are two big variables: One is land — availability, the siting of it — and the other is money. So we had the land available and it helps preserve the ability to put affordable housing in uptown,” Bowman said. Both parcels are currently parking lots. One is about an acre, behind the Charlotte Ballet at 10th and Church Streets. The other is a little over an acre at 7th and North Tryon streets. That's right in the middle of a two-block area slated for redevelopment in the next few years. The planned Seventh & Tryon project would include shops, offices, a hotel and affordable and market-rate apartments alongside a new or renovated Charlotte-Mecklenburg Main Library. Charlotte Mecklenburg Library is leading a coalition of property owners, including BofA and the Charlotte Housing Authority, in plotting the redevelopment. Last May, they picked five teams to submit proposals. They’re expected to pick a developer by April 1, a library spokeswoman said this week. $50 million in below-market loans for affordable housing projects, which the companies say equates to $1 million a year in savings over 15 years. An $11 million grant to the private Housing Opportunity Fund, which plans to make investments alongside the city of Charlotte. $2.5 million for “economic mobility programming and grants” over five years. Private-sector efforts are happening alongside a stepped-up city commitment to create more affordable units. That includes $50 million in bond money approved by voters last fall for the city’s Housing Trust Fund, more than triple the size of previous housing bonds. Three of Charlotte’s largest financial corporations are planning to invest more than $70 million to increase the affordable housing stock in the city and its surrounding areas. City housing officials say they've received new proposals for 620 units of affordable housing, which, along with prior commitments, would eat up the entire $50 million in Housing Trust Fund bonds that voters approved in November. But officials hope a private-sector fund can help boost the number of units created in the next few years. Growth and development have brought an affordable housing shortage in Charlotte. You can see it in neighborhoods all over the city, especially those closest to uptown. In WFAE's series Finding Home, we're examining those challenges every Monday in 2019. Mark Rumsey reports on affordable housing items on Charlotte City Council agenda Monday night. Charlotte City Council members Monday evening will get updates on the city’s affordable housing partnerships. A council vote is also scheduled on changes to the policy that guides where new affordable housing units are built. Five development teams have been asked to submit proposals to redevelop a two-block area along North Tryon Street in uptown Charlotte. The planned Seventh & Tryon project would include shops, offices, a hotel, and affordable and market-rate apartments alongside a new or renovated Charlotte-Mecklenburg Main Library.